What Should I Do If My Child Cries on the Plane? The cry of a child on an airplane has become one of the most polarizing aspects of air travel in our time. 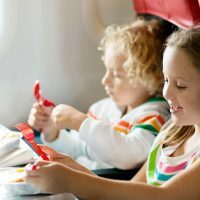 Passengers take to social media regularly complaining about crying babies; a 2018 State of Travel Survey from Airfarewatchdog revealed 46 percent of respondents prefer a separate family section of the plane for people traveling with children under 10 — and some non-U.S. airlines have created such sections. The controversy leaves parents of young children in a difficult spot: on one hand, air travel is a necessity for families who need to travel long distances to see their relatives, or get a much-needed break. On the other hand, no one understands more than a mom or dad how exasperating it can feel to hear a baby crying non-stop in an enclosed space. We interviewed some therapists and travel experts about how to handle the inevitable tough travel moments that arise when your kid starts crying. Here are their recommendations for navigating that emotional turbulence. “Children cry. Children cry on planes. Sometimes there is not much you can do about it — at least, not for the child,” says Raffi Bilek, a family counselor and director of the Baltimore Therapy Center. But what you can do is go into your flight equipped with the right frame of mind. Sounds simple, right? But, of course you know how hard it is to maintain your calm when you have an inconsolable infant screaming in your ear. “It may help to remind yourself that what you are going through is normal,” says Bilek. “You are treading a path walked by many parents before you. You and your offspring will survive this situation, as well the people looking at you with annoyed expressions.” Experts say it’s also important to disconnect yourself from the negative energy you may be picking up on from other passengers. Soothing words and shushing might be your go-to methods for keeping your baby calm on an airplane, as they are at home, but Baudino offers the following additional strategies. She says this works better than traditional shushing, because a child’s nervous system is telling them they are in stress, so you can combat that by gently telling them the truth of what is really happening. “Let them know they’re seen and soothed and secure,” she says. Occasionally, you hear about parents creating “pre-apology” goodie bags for the passengers sitting near them and their fussy babies. Experts and parent communities have varying opinions about whether these are necessary. After all, some people reason, a baby has a right to travel just as much as the other people with annoying — if not worse — habits that regularly board airplanes. But if anything is needed in a high-stress, screaming kid on airplane situation, it’s kindness — kindness directed toward the child and his or her parents. “When my son was 1, we had a red-eye flight back to the mainland from Hawaii. He cried for the first half of the flight and then would not sleep,” says Heidi McBain, a licensed marriage and family therapist in Flower Mound, Texas. “When everyone around me was sleeping — and my son had finally stopped crying – a flight attendant came by with a small bottle of wine and said, ‘You look like you could really use this!’ It was such a sweet, kind gesture full of empathy and caring, and made me teary-eyed,” she says. It’s easy to pick up on the negative vibes when your child is crying, but look for the kind faces instead. Embrace the guy making goofy faces at your child from the row behind you. Share an eye-roll with a fellow mom — most parents have been in your shoes before. And the next flight you’re on where you hear another family struggling with a crying child, try your best to practice kindness, whether it’s sending a glass of wine, or even just a sympathetic smile.